I am truly amazed and thrilled that bald eagles have made such a great come back. Growing up, we never saw bald eagles around Penacook/Boscawen. My first sighting of a wild bald eagle in these parts was many years ago, and it was a rare sighting. 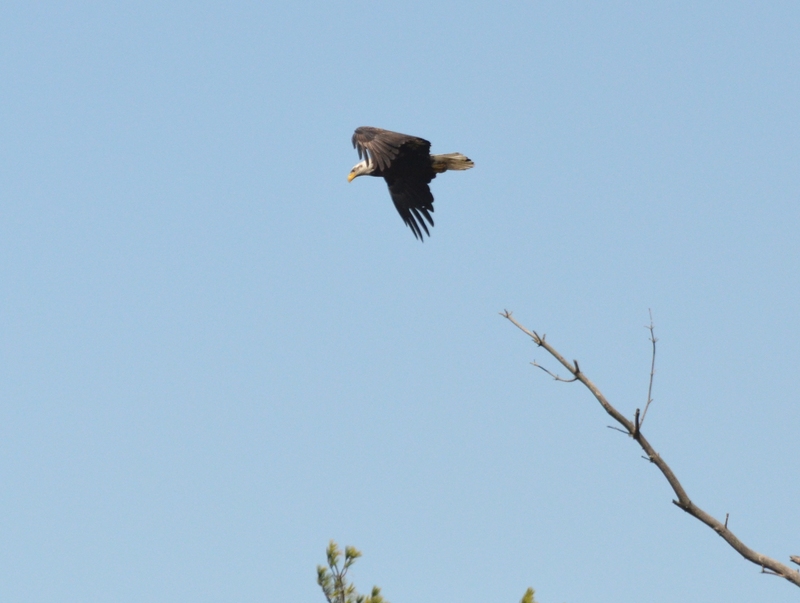 In the past few years, I have regularly seen bald eagles in the area. They love hanging around the Merrimack river. During the late winter Eagle Count that I was a volunteer for – I saw 7 different eagles that day. I never tire of seeing them. Yesterday, I swung by Crete’s farm and a banded sub-adult was perched in the dead pine branches in a tall pine tree. There is a small pond below the tree. It is a great place for the eagles to grab a quick meal of fish. Luckily, I had my camera in the car and could snap some photos. I have also been watching the eagle nest in Decorah, Iowa. Again this year, there are three eaglets. It is fascinating to see the parents feed and protect the youngsters. It is amazing how clean the nest is kept and how both parents share the responsibilities. I also find it interesting that even the smallest eaglet knows not to poop in the nest … they back up and “shoot” out of the nest. It must be a natural instinct – interesting. They parents also keep the food “pantry” away from the sleeping area – to keep the little ones clean. Dad makes sure the nest is keep strong and repairs any damage. He also regularly brings food. Mom likes to feed the eaglets – dad likes to as well – but Mom appears to rather do it herself. The interactions of the eagles are addicting. The sight has had millions of viewers. If you would like to watch the Decorah Eagle’s nest click here. I can’t believe tomorrow is May! I hope everyone is having a great spring!